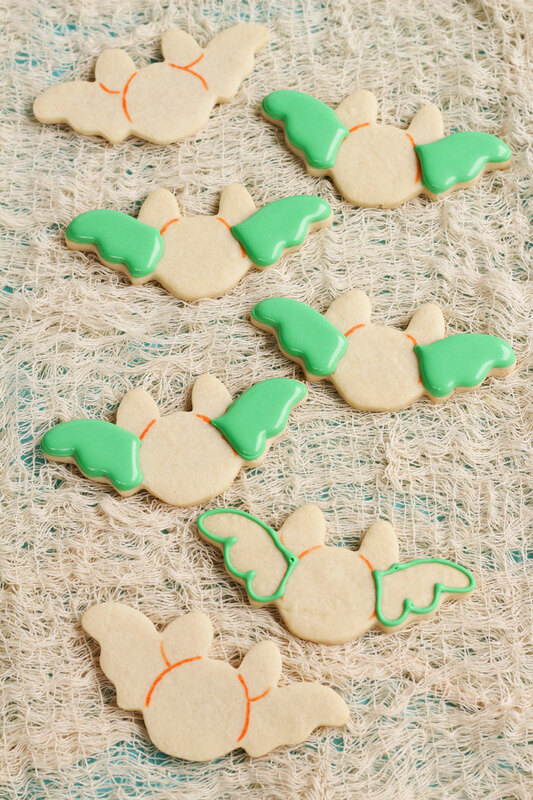 I have a little story to tell you about these bat cookies with stenciled wings. I never in a million years would have thought to make them until I found the inspiration at Cookie Con 2015. Meaghan from Annabella’s Sweets walked by me at Cookie Con carrying a bag that was covered with the cutest blue polka dots. 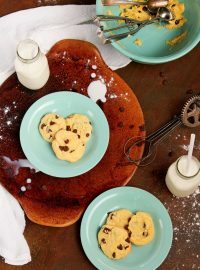 My mind immediately started going crazy thinking of different ways I could turn those adorable polka dots into cookies. I’ve got it! 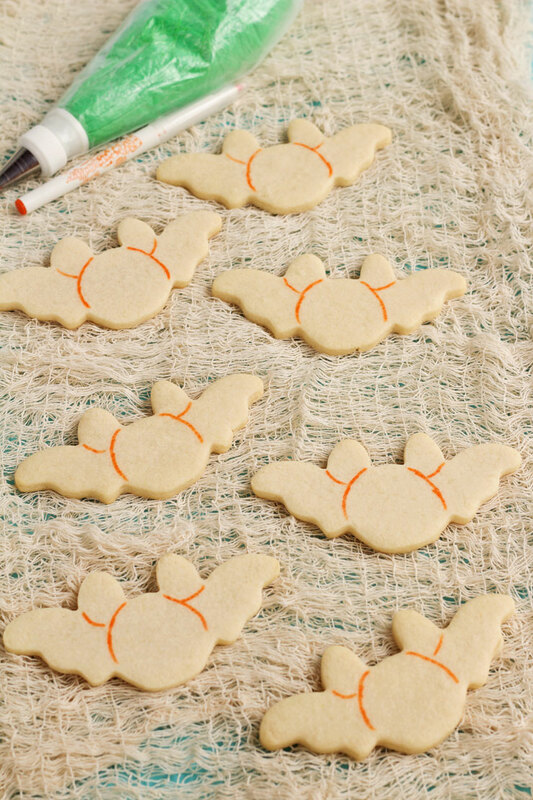 Bat Cookies! 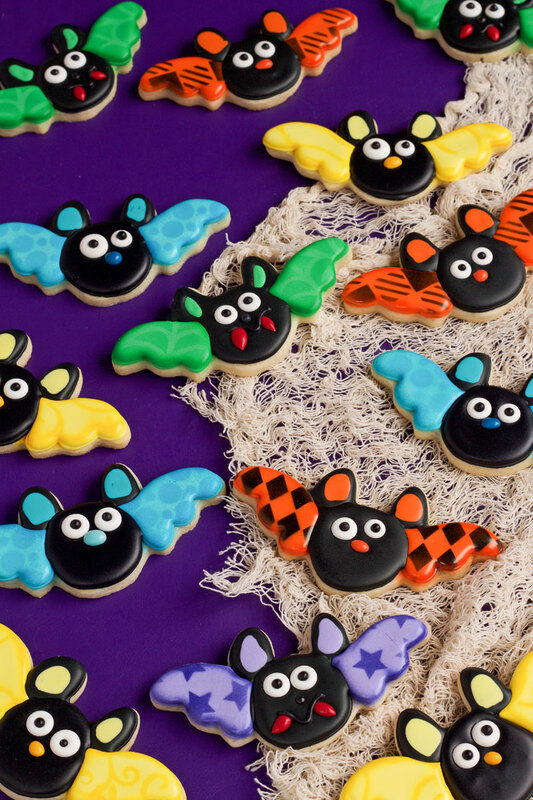 I told Meaghan that her bag just inspired me to make some bat cookies with polka dot wings. She gave me a little grin (she is adorable) and her business card and I told her about my plan. 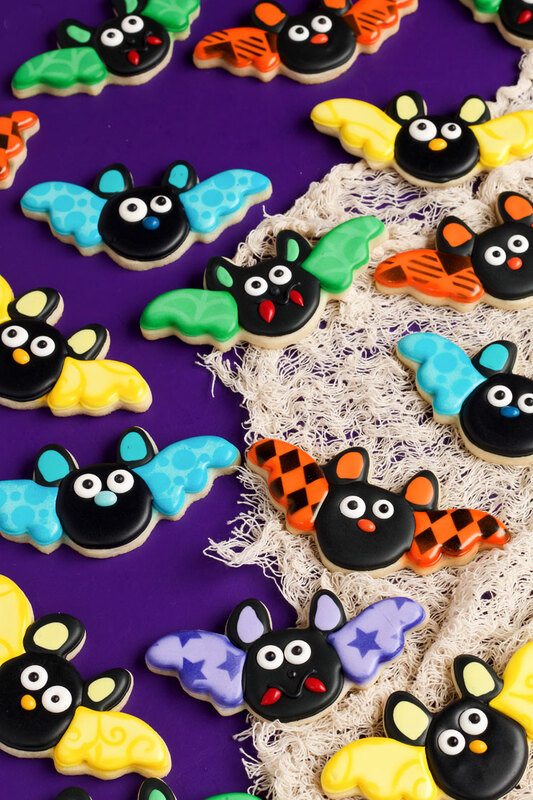 When I got home from Cookie Con I baked some bat cookies with the intention of making them all have polka dot wings until I opened my box of stencils from The Cookie Countess. I saw a spider web, Bubble Circles, stars, buffalo plaid, Harlequin, and the Capricious stencil. 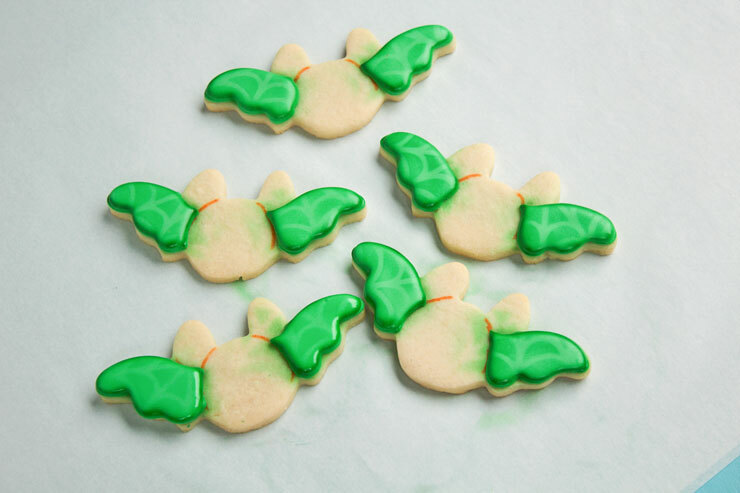 How in the world could all of my bat cookies have only one pattern? So I did it. I made a bunch of cookies with different patterns and I love the way they turned out! 4mm Black Sugar Pearls for the noses or you can use whatever you have on hand. I know the supply list seems long but I bet you already have most of the items on the list. 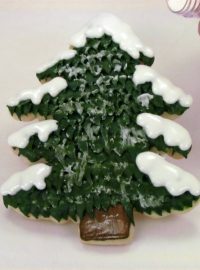 I just wanted to list everything for new cookie decorators and anyone looking to join this amazing cookie journey with us. 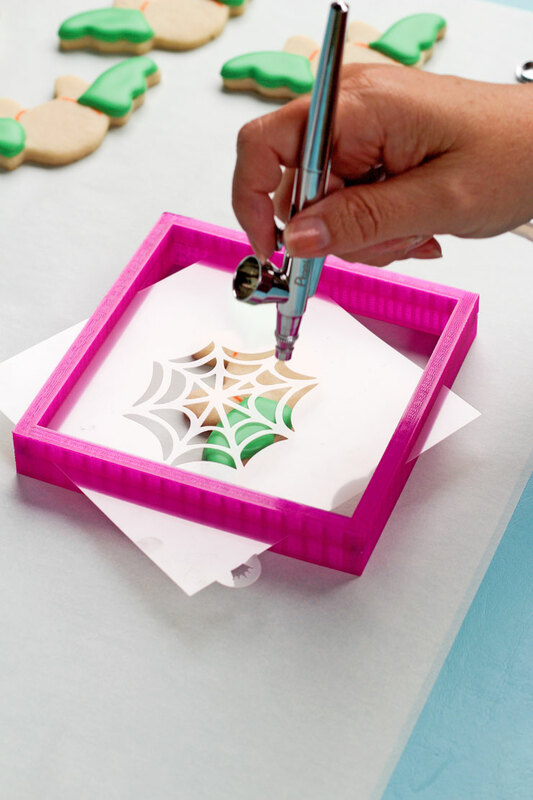 If you haven’t bought stencils to use on your cookies you really need to visit Hillary at The Cookie Countess. 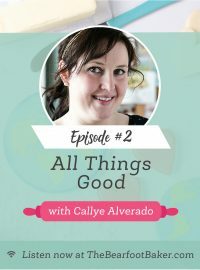 She has a huge selection of any kind of pattern you can think of. Not only that, but she is one of the sweetest people I have ever met. 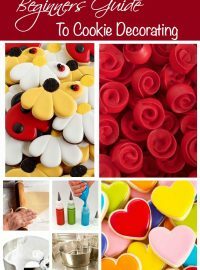 She helps make cookies decorating beautiful and oh so easy! 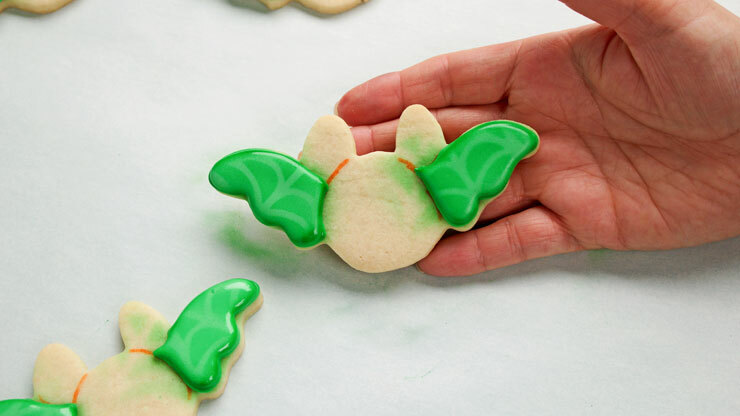 Begin by outlining the bat body with an edible food marker. Next, outline and flood the bat wings and let them dry for a few hours. Then, place the stencil of your choice into the stencil genie or you can use magnets to hold the stencil in place. Next, spray the wings with the airbrush gun. If you want to know how to airbrush using stencils, here is a tutorial for you. 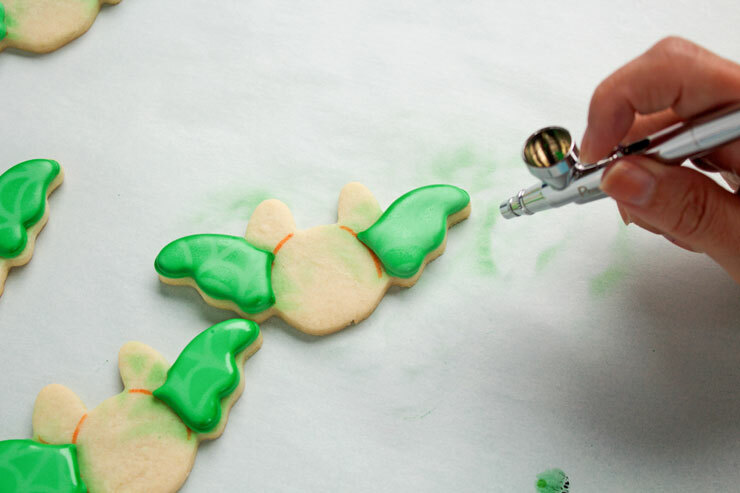 After the pattern is on the bat cookies, outline the edge of the wings with the airbrush color you used to stencil the pattern. Hey look! He has friends! Now you are ready to make the bats body. 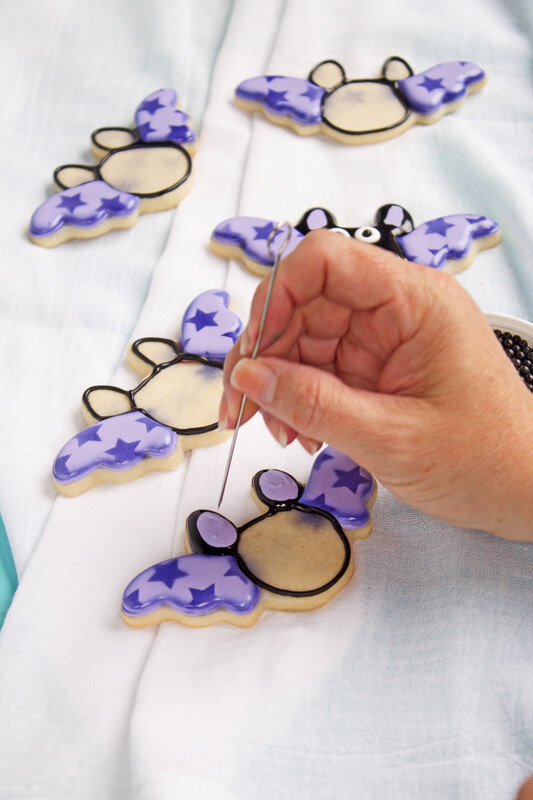 Outline the ears and the body with the black icing. Flood the ears with the black icing. 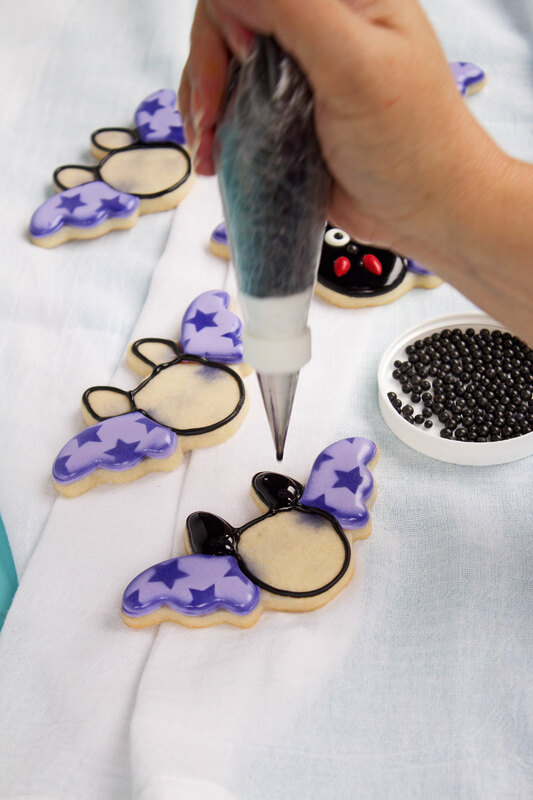 While the black icing on the ears is wet, add a tear drop shape with the same color you used for the wings. 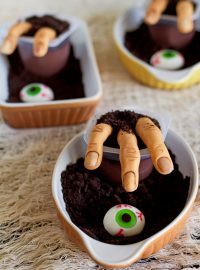 Next, flood the body with the black icing. 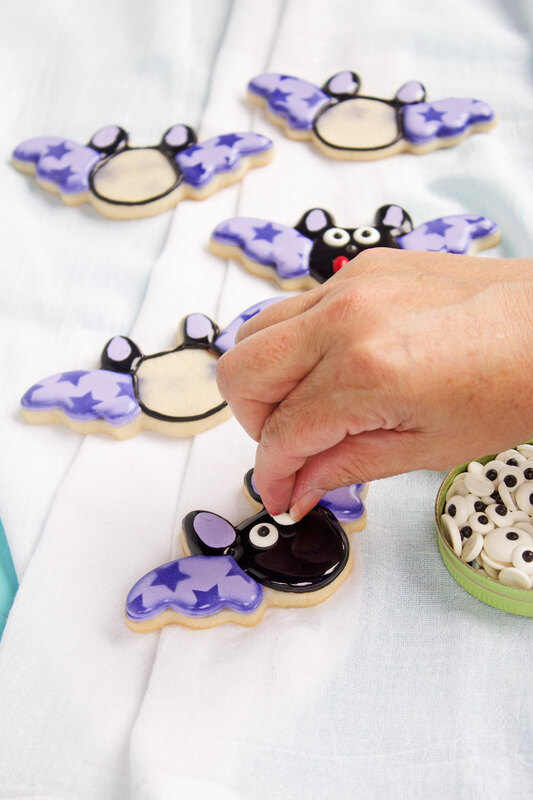 Add the candy eyes to your cute little bats with stenciled wings. Now here is where I decided to do something a little different while I was making the bat faces. I found some cute chocolate covered sunflowers seeds that look more like ovals than tear drops. So, I added some fangs with the tear drops and some cute little button noses with the oval seeds. 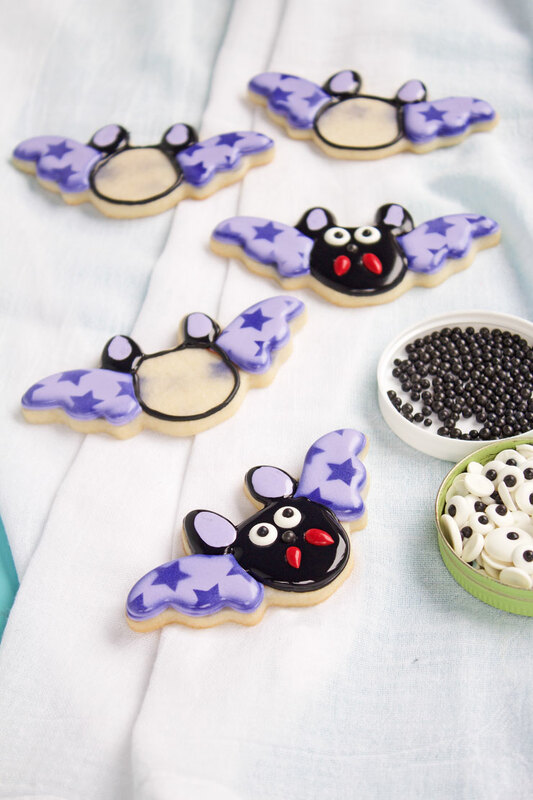 The fanged bat cookies with the stenciled wings needed a nose so I added a 4mm black sugar pearl. Everyone knows a bat needs a nose. Right?!?! This just goes to show you can find inspiration anywhere! Thank you Meghan for walking by me at Cookie Con carrying that adorable polka dot bag! Look what you inspired me to make! SMOOCH! I especially love the polka dot wings, but I am a bit obsessed with polka dots. The other patterns really fun too. You are so creative! I love how they turned out, and thank you for the step-by-step instructions. 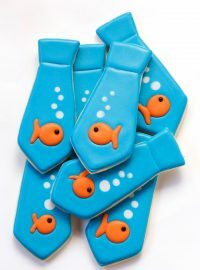 These are soooo adorable! As always you nailed it! Lisa, What a cute idea! I just love the various stencils and colors. Great video too! Of course I find this AFTER I make my bats. Lol. I loved meeting you at CookieCon. I only wish I would have brought my book to have you sign it! (I am the one from Indiana.). Have a great week! !